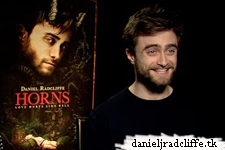 Here are the US press junket interviews for Horns with Daniel and Juno Temple. Horns is available online and on demand and is playing in select theatres. The Chief Report posted photos and a review online and there are also interviews from contactmusic.com, The Blot magazine and The Sag Harbor Express. If more appear online I will add them. Edit: A photo from Cinema Today. Update: 12th August 2016. A DVD message via Couch Potato I missed in 2015. Update: 23rd August 2016. Also uploaded in 2015: Family Video.